All hail Eric Fischer, master of historophotography! 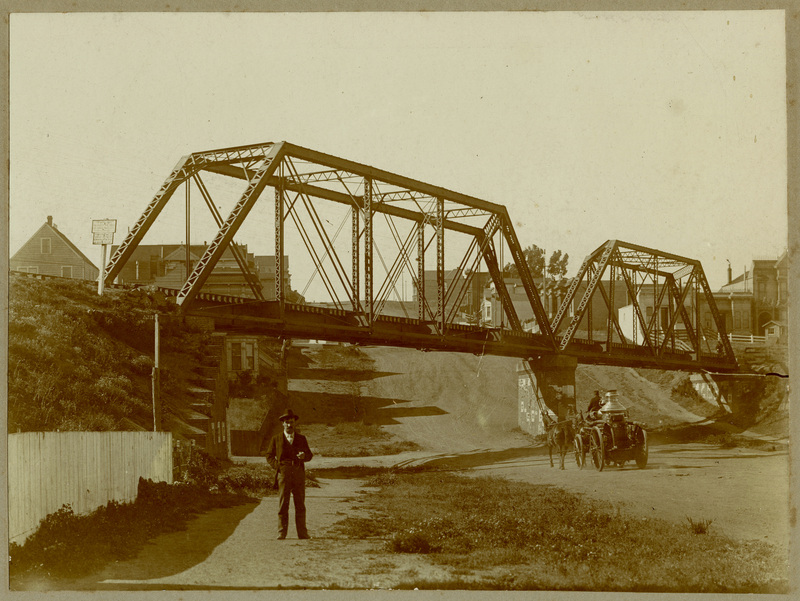 The Southern Pacific trestle bridge over Dolores Street in 1910. More on the path of the SPRR here and here. 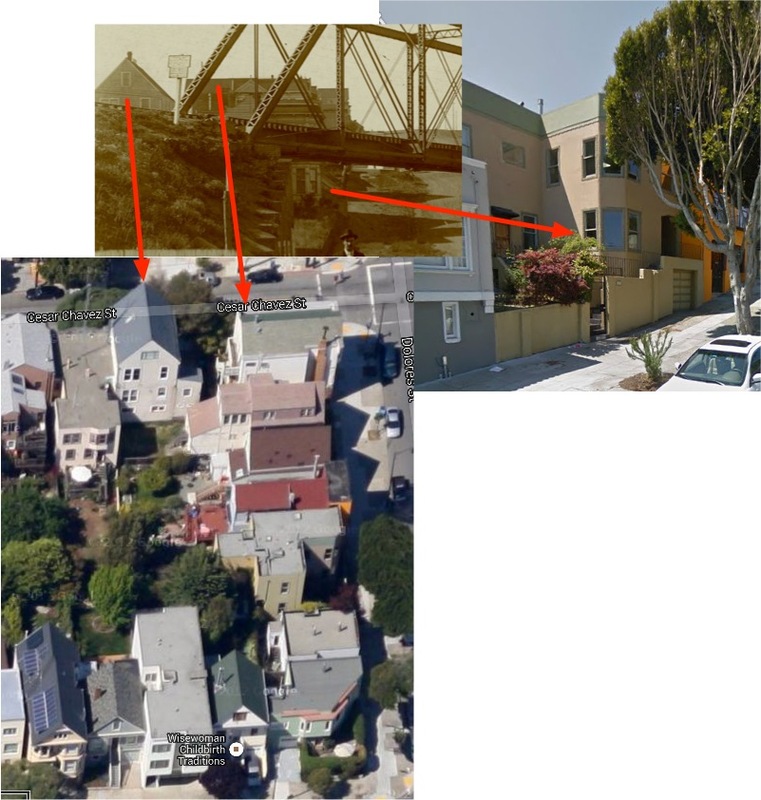 And @markasaurus did a nice walking tour a few years back. Hey, look, it’s the milk truck! 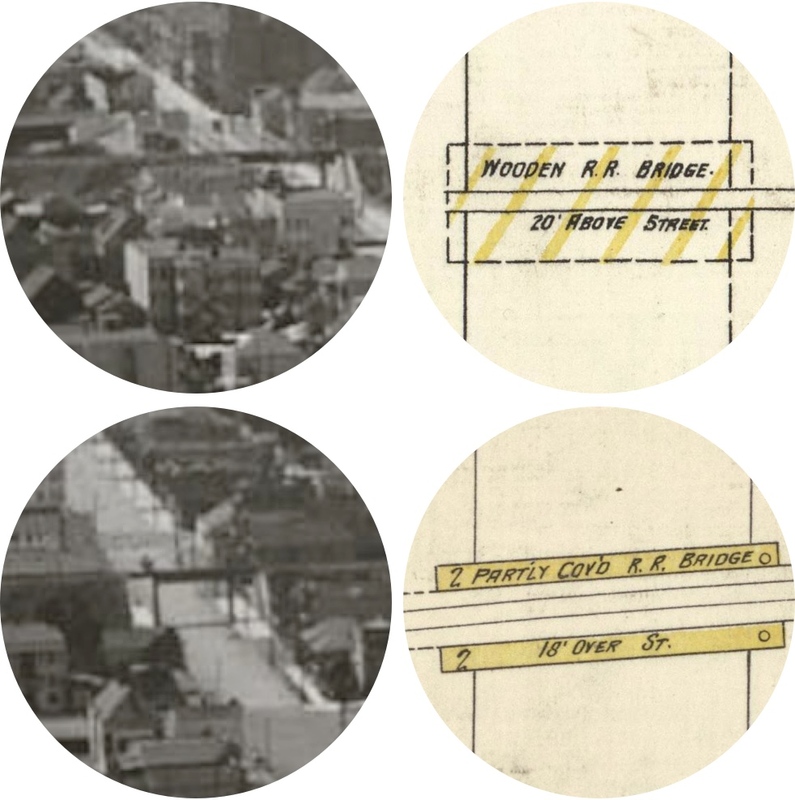 I stitched together some 1914 Sanborn maps for your historo-reference. 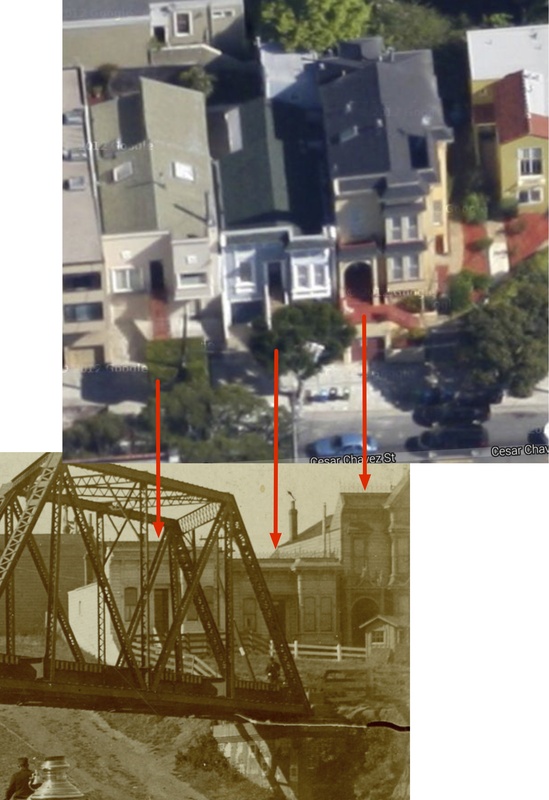 I hadn’t realized that the all-knowing FoundSF had written a piece on the Dolores Street Trestle (hey, great band name) until after I started this post. 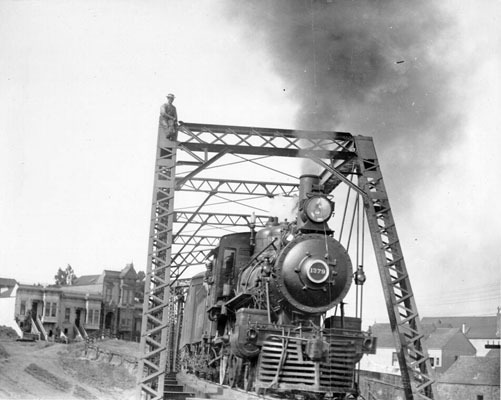 They found this rather amazing photo taken around 1940, just a few years before the funeral train service was stopped and service on the line completely shut down. I cannot even imagine how many kids must have gotten in trouble for climbing up that thing. Harder to imagine is that the train was there first, and the street grid grew around it. 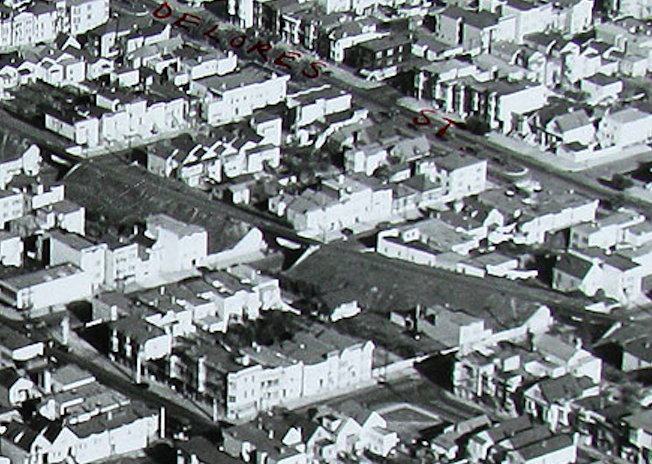 The railroad was built in 1860-1863, and the berm was to minimize the change in grade from the Bernal Cut. 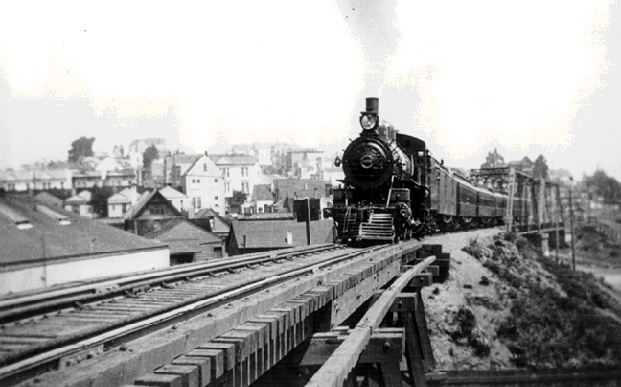 The first full-sized steam locomotive produced in the state of California, an American 4-4-0, was built for the SF&SJRR by the Union Iron Works in San Francisco. It was appropriately named the “California”. 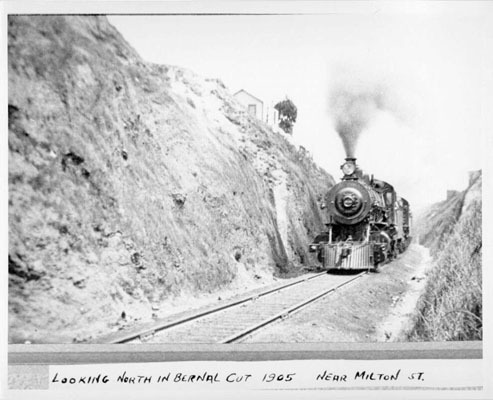 Its inaugural run was August 30, 1865, during which it set a speed record of 67 mph (107 km/h). 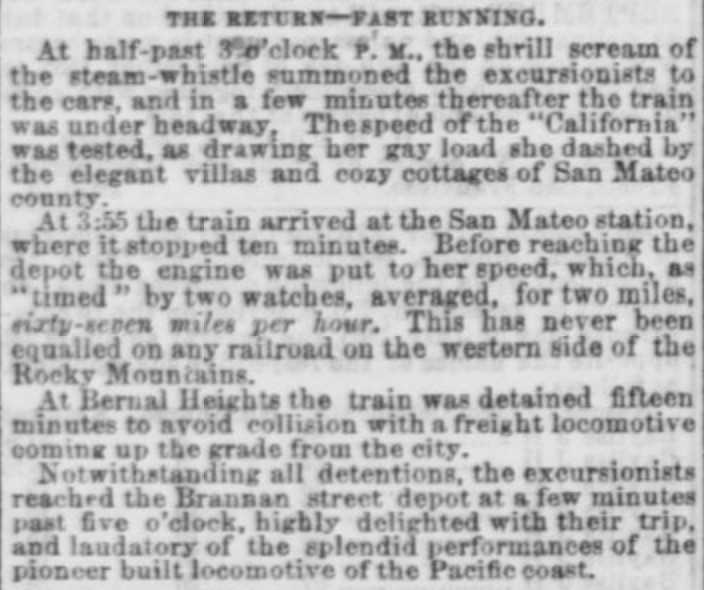 149 years later, Caltrain’s top speed today is just 79 mph. Hey, at least it’s not slower! Well, actually, it is. 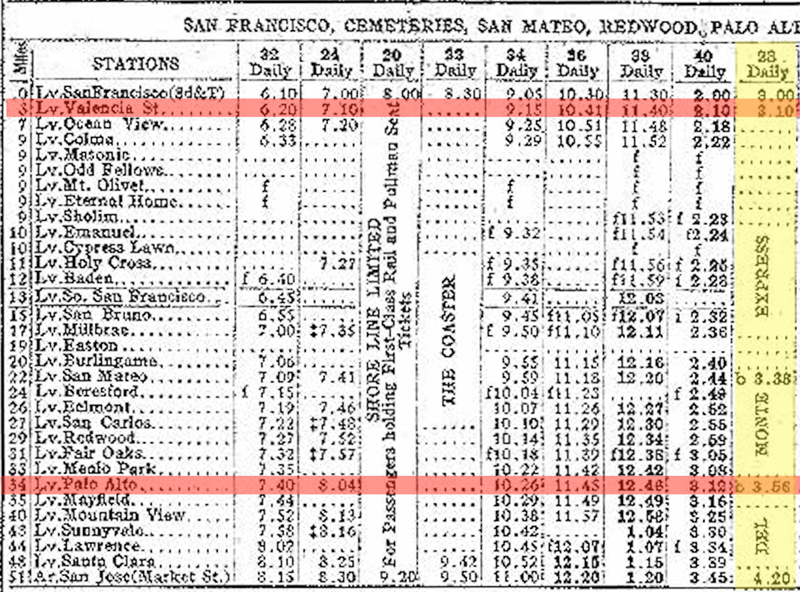 Yes, you could make it in 46 minutes from Valencia St to Palo Alto in 1907. 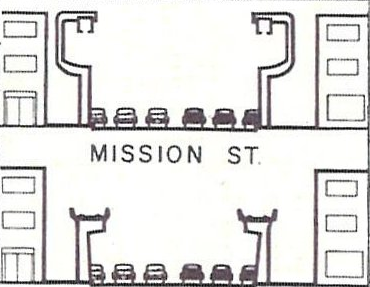 You’d be hard-pressed to *drive* to Palo Alto in 46 minutes from 24th & Mission today, even without traffic. 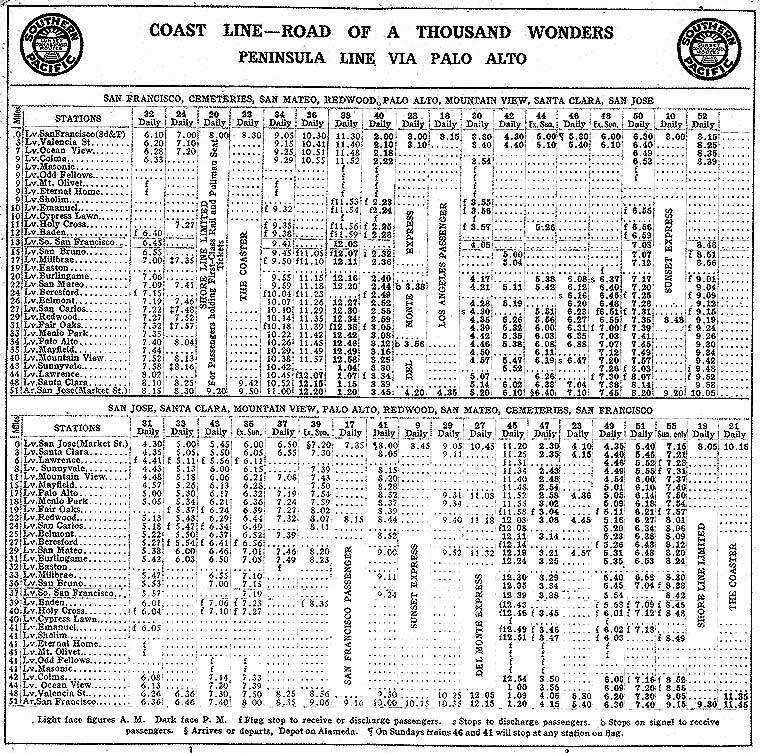 This rather incredible report on the history of the SF to SJ line written in the 1940s has 1892 schedule and fare information. 55 minutes to Menlo Park. 1:11 to Palo Alto. 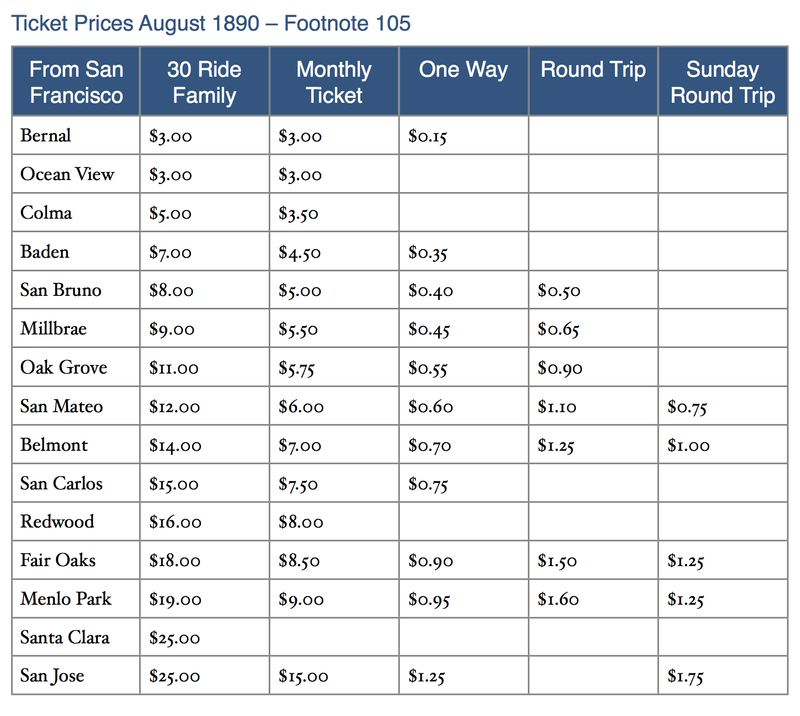 Whoa, that 95 cent one-way fare to Menlo Park adjusted for inflation is $23! 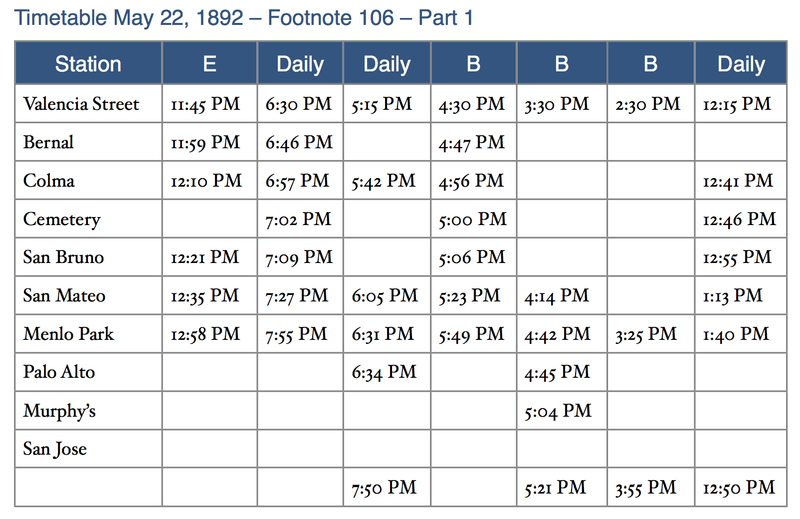 But the monthly pass of $9 comes out to $226, not all that far from today’s 3 zone fare of $179. 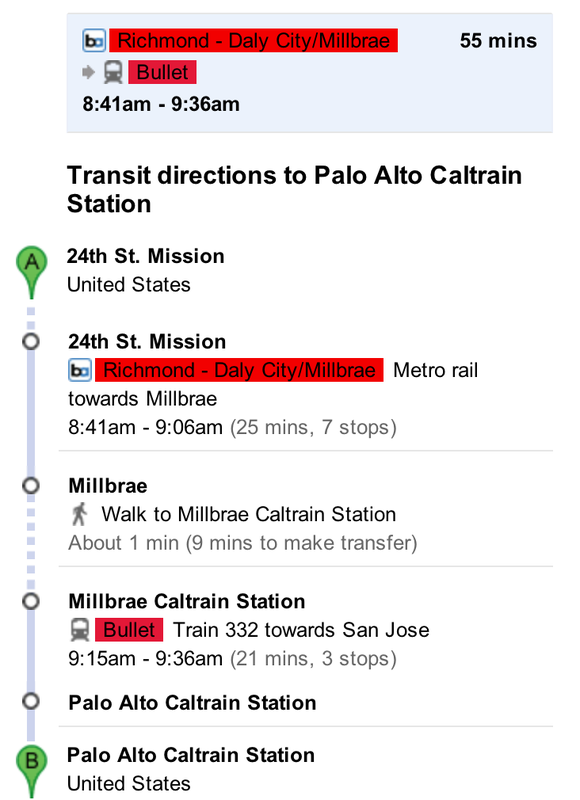 While I realize that you can catch a baby bullet from 22nd St to Palo Alto in 34 minutes, you still have to get to the charming 22nd station — good luck with the bus connection. 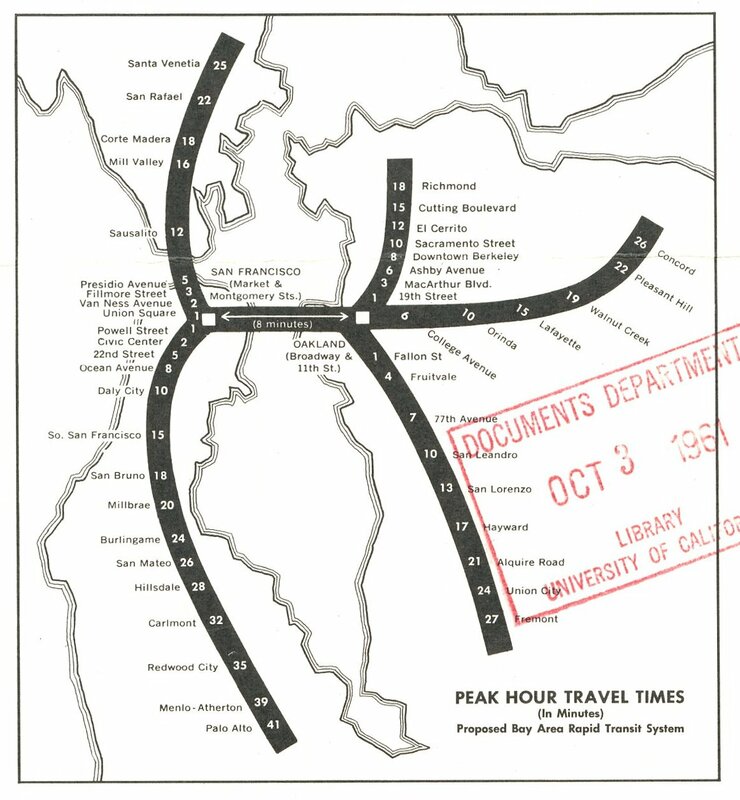 This map from Eric Fischer shows estimated travel times — the times are a little on the optimistic side, but 36 minutes to Palo Alto from an unbuilt 22nd Street station. 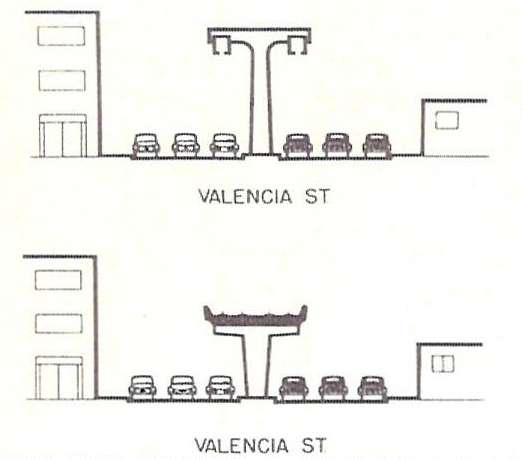 Of course, it’s easy to look at the benefits of a centrally located above-ground transit system and ignore the inevitable tradeoffs. 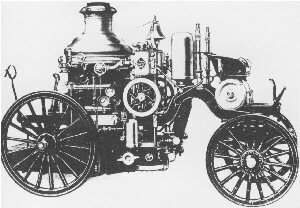 SCHWARTZ: We think of steam as being this very romantic form of transportation, we hear that sound. But the reality was, there were huge disadvantages. The reality of a steam train is, if your windows are open when it shows up, your whole room will be filled with soot, and the stink of the soot, and the cleaning of the soot, and the noise. Not everybody wanted these. 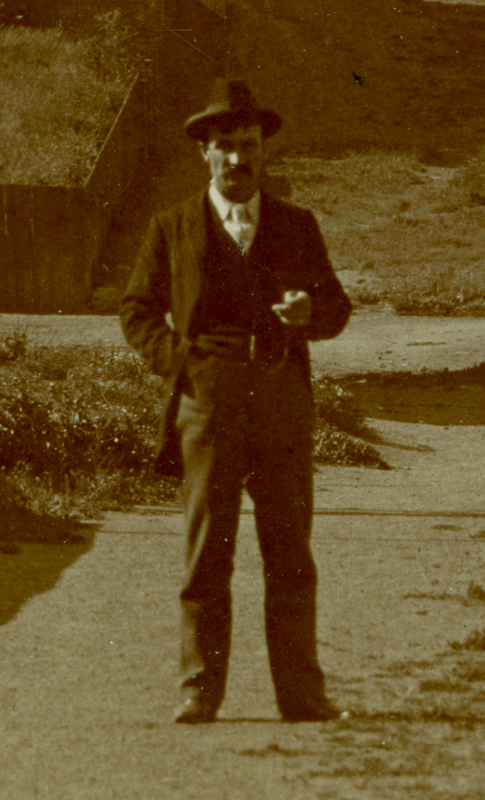 ECHEVERRIA: Round about the early years of the twentieth century, the public was fed up. But soot, steam and 100 decibels might not even keep housing prices in Noe Valley under $2 million. 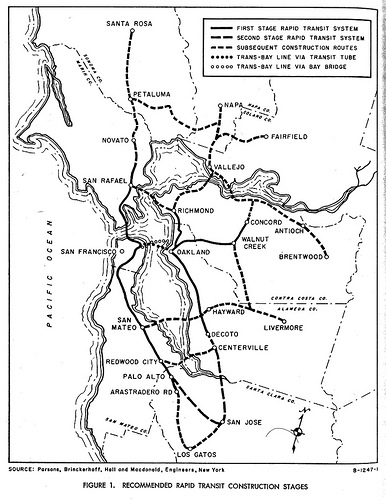 Sadly, the Bay Area doesn’t have a coherent transit policy or we’d have a train that goes over 100 mph and we’d have regular service to Palo Alto in 15 minutes and San Jose in 30 minutes. But hey, let’s save that kind of efficiency for China, Europe and Japan. I like the peeling wheat-pastes on the trestle! 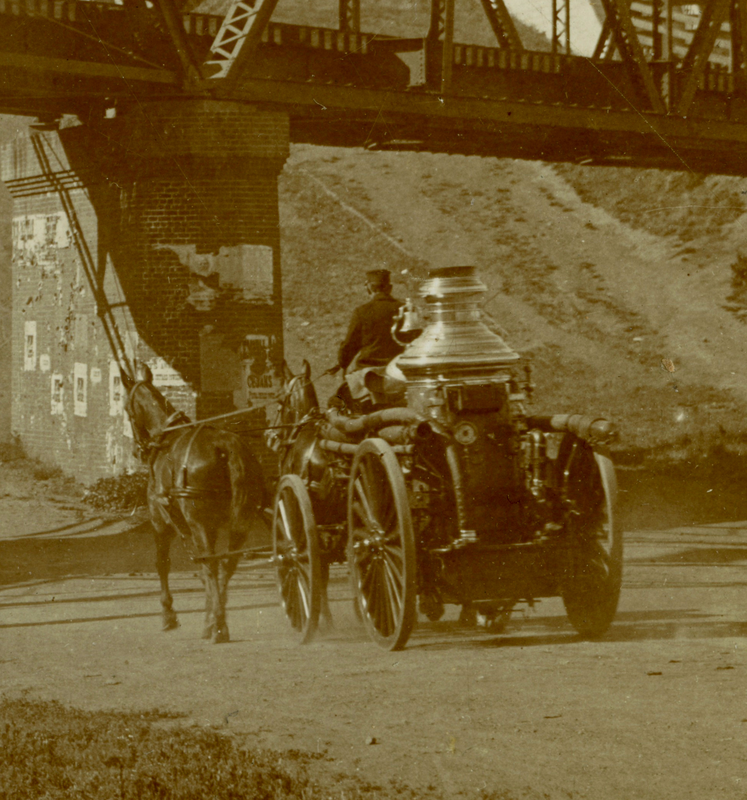 Speaking of historical firefighting in San Francisco, I’m almost done with this and it is GREAT. Thank you thank you! 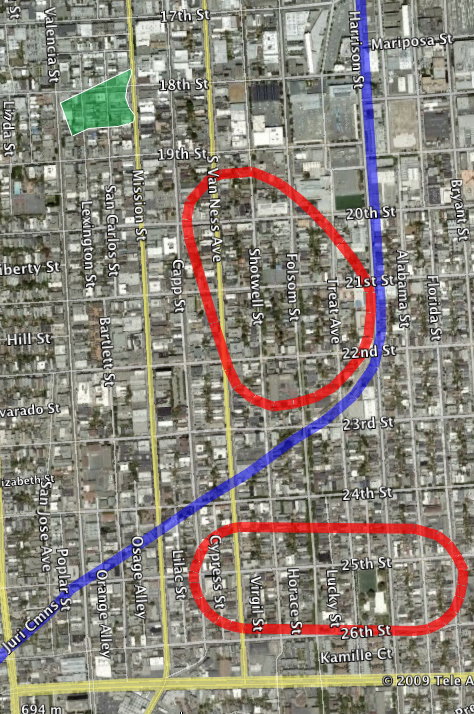 I love looking for remnants of the SPRR ROW through the Mission. 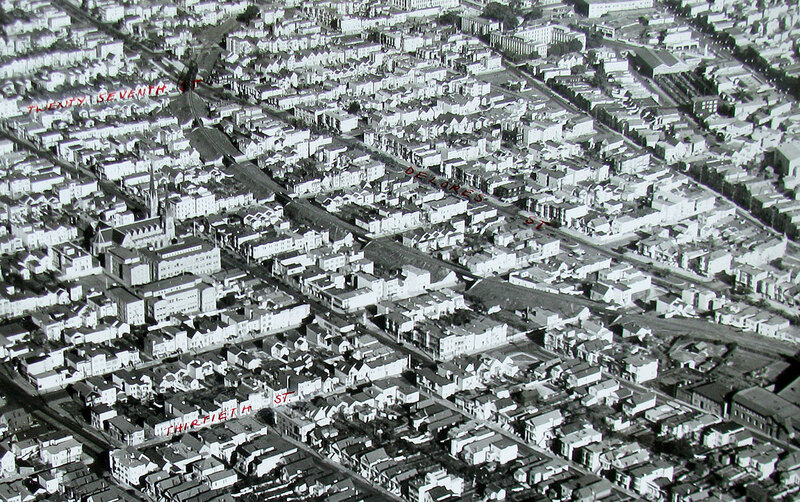 It would be great to memorialize it with some sort of artwork on the street where it crossed the ROW. 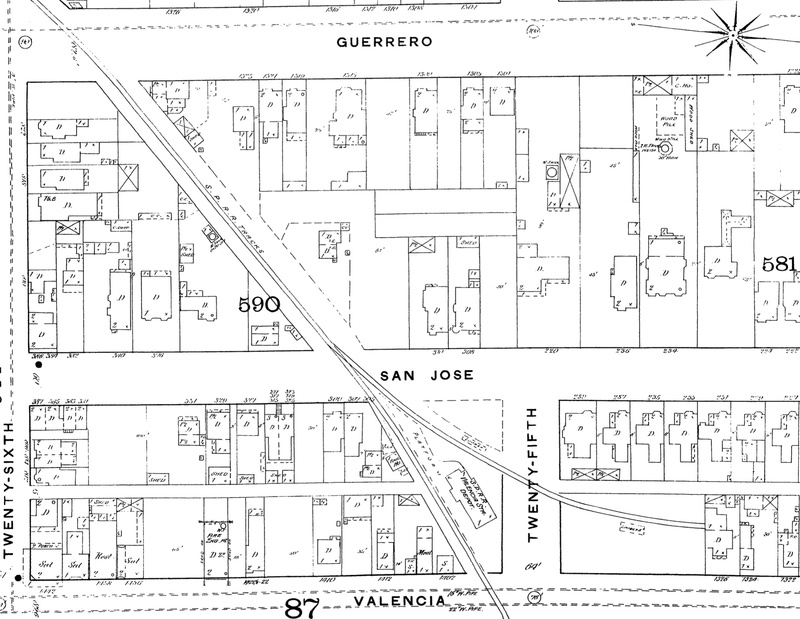 What is the source of the zoomed in map showing the Valencia Street depot map between 25th and 26th above? Thanks for this! 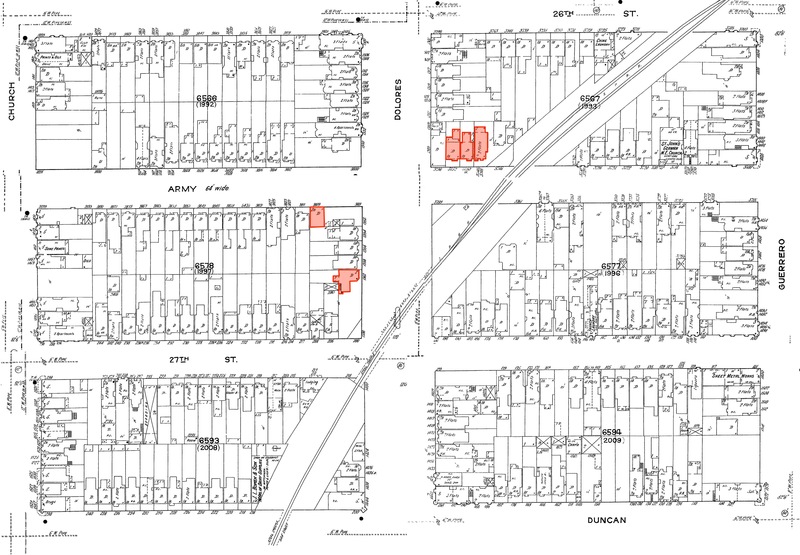 Any guess as to why those handful of lots are outlined in red in the map above? Hey Eq! I did that — those are houses visible in the photo.